50% NON-REFUNDABLE DEPOSIT REQUIRED TO RESERVE MORE THAN 50 CHAIRS. SET-UP/HANDLING CHARGE IS EXTRA PER CHAIR (#899). CHAIRS HAVE METAL FRAMES WITH RESIN SEATS & BACKS. 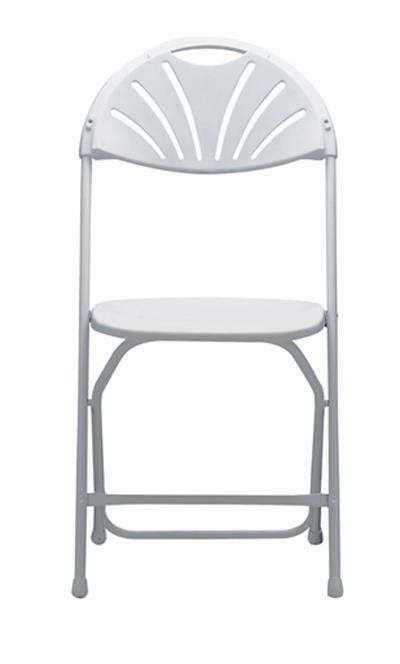 * Please call us with any questions about our chairs white wedding fan back rentals in Old Town ME, Milford, Bangor, Pea Cove, Eddington, Bradley, Orono, Bangor ME.